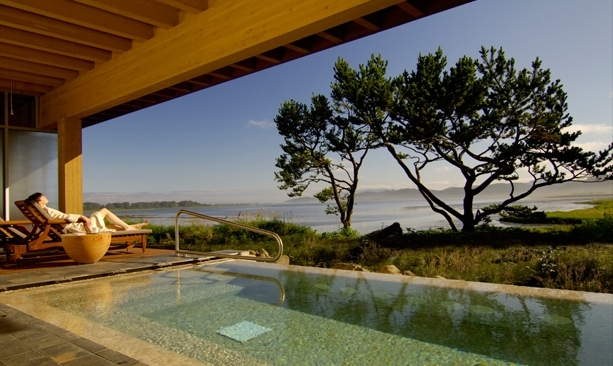 Visitors to Salishan Spa enjoy stunning views of Siletz Bay. Photo by Mike Houska. 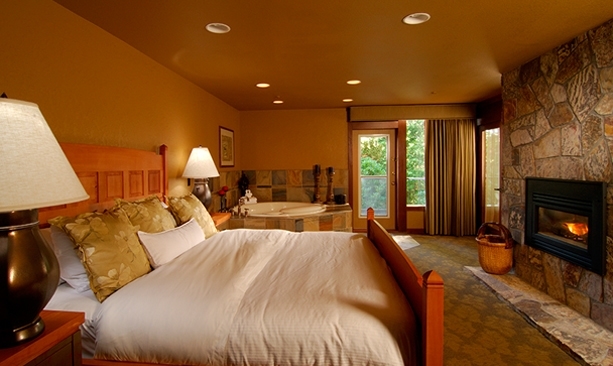 Wood and stone accents bring natural beauty into the rooms at Salishan Spa & Golf Resort. Photo by Mike Houska. 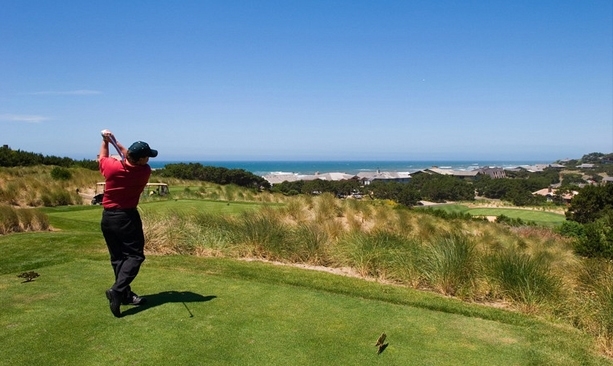 The 18-hole course at Salishan, originally designed in 1965, was revamped in 2004 by PGA Tour veteran Peter Jacobsen. Photo by Greg Vaughn. The Overleaf Lodge sits on the doorstep of the Pacific coastline, with upclose views of it's crashing waves and blowing spray. Sandpines, designed by Rees Jones (son of Robert Trent Jones, Sr.) was named America’s best new public course by Golf Digest in 1993. Photo by Mike Houska. 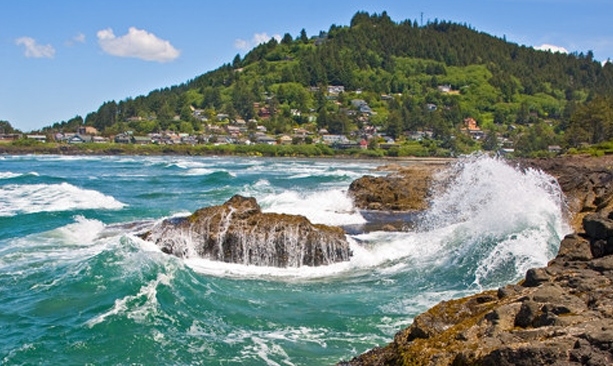 Yachats (pop. 690) is a quaint coastal town located about halfway between Florence and Newport. Photo by Larry Andreasen. 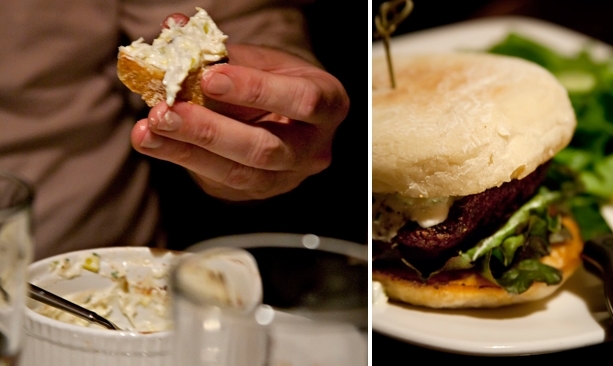 Ona Restaurant's rich Dungeness crab dip and housemade quinoa falafel burger. Photo by Catherine Murray / www.photokitchen.net. 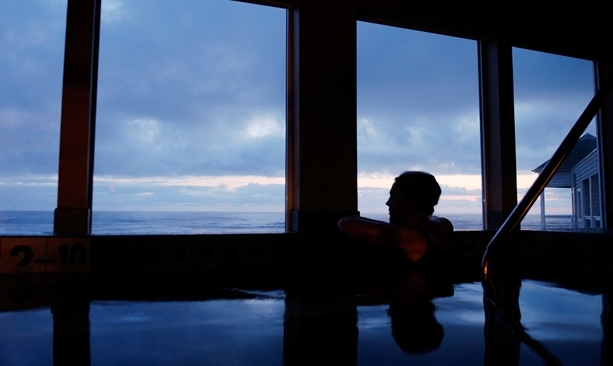 The hot tubs at the Overleaf’s Aveda Spa look out on the ocean from the third floor of the lodge. My wife Deidre is at best an indifferent striker of the golf ball. I find a driving range visit more relaxing than the most nuanced massage. We both appreciate coastal vistas and find them infinitely enhanced if they’re enjoyed while our children are safe at home with a friend. With our priorities thus clearly established — Oregon Coast, here we come! Since the explosion of Bandon Dunes onto the international golf scene in 1998, the Oregon Coast is no longer a secret to serious linksters. But Bandon is not the end-all; you can combine fine golf with first rate spa services at Salishan Spa & Golf Resort, just two hours and change from Portland in Gleneden Beach. After dropping our daughters at school, we ambled down Highway 18 to the Coast and were sitting in The Grill at the Salishan Clubhouse enjoying a couple of burgers before the lunch time rush. After checking in, I left Deidre to unwind while I hustled to the first tee. 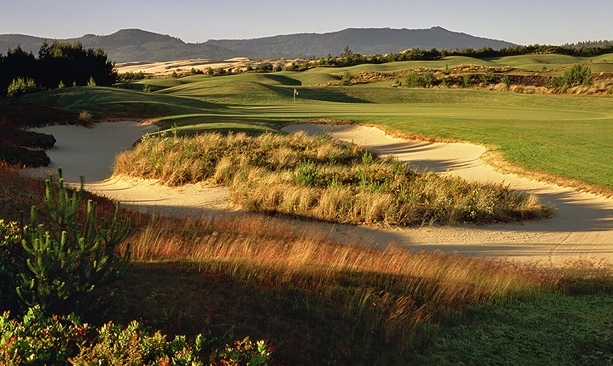 The 18-hole layout at Salishan has two distinct personalities. The front nine is a parkland layout winding up and down through old-growth Douglas fir while the back nine marches toward the sea on links-like land. The original 1965 design was revamped in 2004 by PGA Tour veteran Peter Jacobsen of Jacobsen Hardy Golf Course Design, primarily to improve drainage and enhance the playability of the greens. Despite recent rains, Salishan played like a course east of the Cascades, which is to say dry and firm. Two holes on the back nine were reimagined by Jacobsen, and they are Salishan highlights. The short par-5 10th hole begins on an elevated tee where a double-dogleg unfolds to a green that’s framed by Siletz Bay. The par-3 15th hole tees off from high on a bluff of dunes with vistas extending north over the Pacific Ocean. As I walked to my drive on the 10th hole, I passed close to the Salishan Spa, where Deidre was midway through what she later described as “the best massage of my life.” Created by world-renowned spa designer Cary Collier, Salishan Spa is a study in polished wood and slate, in keeping with its tranquil setting by Siletz Bay. Indoor and outdoor whirlpool tubs look out on the water. Treatment rooms are equipped with heated hydraulic massage beds; several rooms have two beds for couples treatments. Deidre opted to extend her deep tissue massage an extra half hour instead of partaking of one of Salishan’s facial or body treatments — though the caviar facial sounded tempting. After a drink at the Attic Lounge in the main lodge, we opted for dinner at Prime Steakhouse — a filet mignon for me (I did walk the course, after all! ), and lighter fare for Deidre in the shape of Dungeness crab cakes with roasted fennel and avocado coulis. With Deidre sufficiently relaxed from her massage session and me slightly overfed from my filet, we slept peacefully. If one day of golf and spa decadence is good, it stands to reason that two days are better. 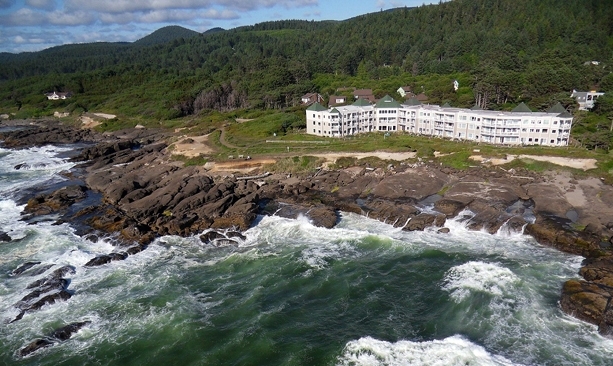 Ever up for exploration, we headed south to Yachats and Overleaf Lodge. The lobby of the Overleaf, decorated with distinctive driftwood sculptures, sets the stage for the property. You’re not merely looking out at the Pacific; you can feel it, as you’re only a long putt away. After settling Deidre into Overleaf’s Aveda Spa, I continued south to Florence and Sandpines Golf Links. Sandpines, designed by Rees Jones (son of legendary course designer Robert Trent Jones, Sr.) was named America’s best new public course by Golf Digest in 1993. As its name implies, the course alternates between pine forests on the front nine and sandy dunes on the back. When the wind picks up (and it often does in these parts), Sandpines can be quite a challenging track. This day, the winds were calm, and I had only my own swing to blame for a far-more-than-par performance. A quick text revealed that Deidre was safely ensconced in one of the Overleaf’s hot tubs, which look out to the sea from the lodge’s third floor; she confessed later that she was just too relaxed to climb out and partake of one of Overleaf’s signature seaweed treatments. Dinner that evening took us to downtown Yachats and Ona, a bistro overlooking the Yachats River. Chefs Michelle Korgan and Anthony Velarde offer a fresh take on quintessential comfort foods — like fish and chips featuring panko-crusted grilled Pacific rockfish, or a meatloaf fashioned from ground lamb, beef and pork. Deidre opted for meatloaf; remembering the previous evening’s overindulgence, I had the house-made veggie burger, concocted of falafel, quinoa, zucchini and mushrooms. We finished dinner in time to head back to the lodge and take in the sunset from our front-of-the-room whirlpool tub — and begin strategizing about our next coastal escape. Chris Santella is a freelance writer and marketing consultant based in Portland. He is the author of 21 books, including the "Fifty Places" series from Abrams, which has 650,000 hardcover copies in print. His most recent book is "Fifty Places To Surf Before You Die." Santella is a regular contributor to The New York Times, The Washington Post, Trout and American Angler. 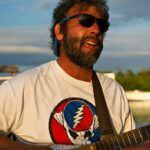 When he’s not writing or fly fishing, he plays guitar and sings in Catch & Release.